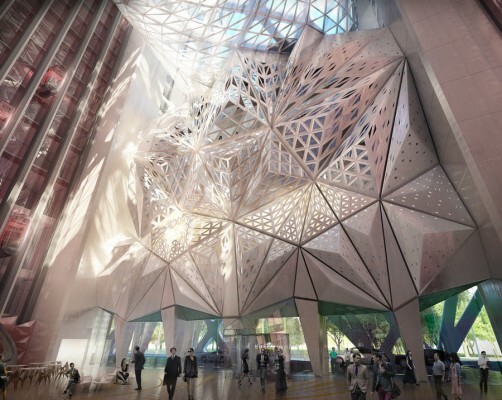 Melco Crown Entertainment, a developer and owner of casino gaming and entertainment resort facilities in Asia, has unveiled the project details and design of the fifth hotel tower at City of Dreams, the company’s flagship property in Cotai, Macau. With 40 floors and a gross floor area of 150,000 square meters, the tower houses approximately 780 guestrooms, suites and sky villas. The hotel also includes a variety of meeting and event facilities, gaming rooms, lobby atrium, restaurants, spa, and sky pool. Integrating extensive back of house areas and supporting ancillary facilities, the tower’s design resolves the many complex programs for the hotel within a single cohesive envelope. 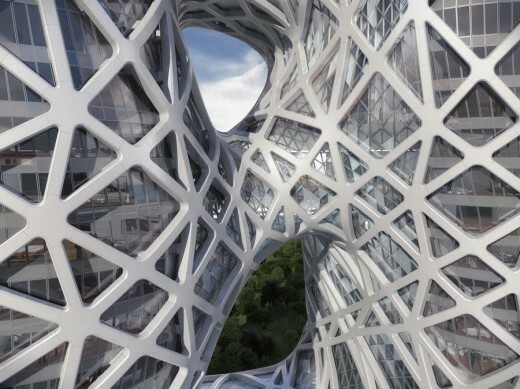 The design combines dramatic public spaces and generous guest rooms with innovative engineering and formal cohesion. The rectangular outline of the site is extruded as a monolithic block with a series of voids which carve through the its centre of the tower, merging traditional architectural elements of roof, wall and ceiling to create a sculptural form that defines many of the hotel’s internal public spaces. 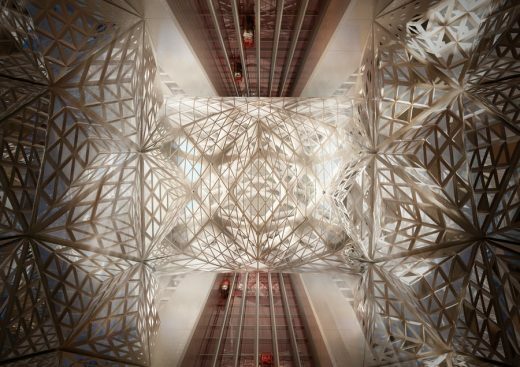 The tower’s exposed exoskeleton reinforces the dynamism of the design. 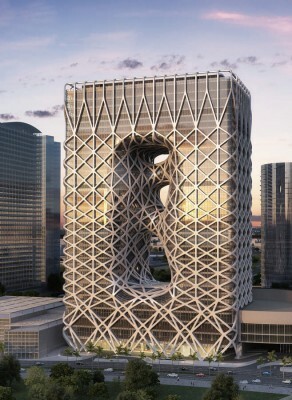 Expressive and powerful, this external structure optimizes the interior layouts and envelops the building, further defining its formal composition and establishing relationships with the new Cotai strip. 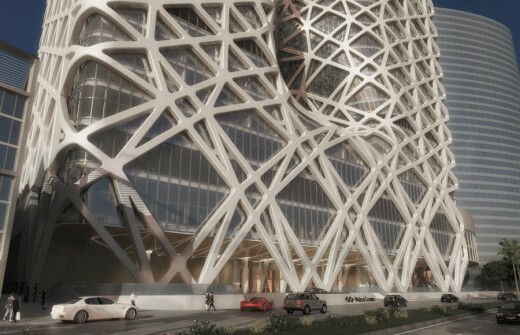 Development of the new hotel at City of Dreams commenced in 2013. The project is expected to open in early 2017. 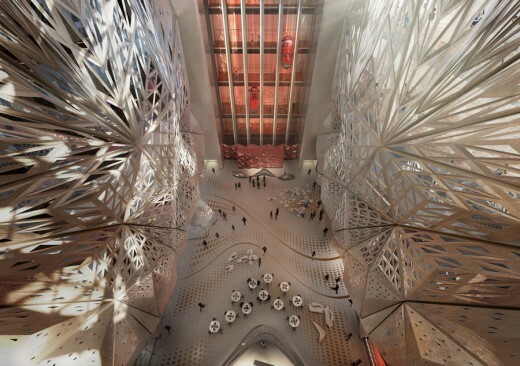 City of Dreams is a brainchild of Lawrence Ho back in 5 years ago, an integrated entertainment resort is set to become the “must experience” destination in Macau. Developed by Melco Crown Entertainment Limited, an entertainment company listed on the NASDAQ Global Select Market (NASDAQ: MPEL), held its official grand opening ceremony in June 2009. Leigh & Orange is proud to have performed as the Executive Architect of City of Dreams.